Dr. John Richmond, chairman of the Department of Orthopedic Surgery at New England Baptist Hospital, says there is no current treatment to slow osteoarthritis. Some patients choose pain management — medication or a brace — which are short-term solutions to delay knee replacement surgery. When James Jacobsen saw the X-ray images of the worn cartilage in his knees, he understood why his right knee had been causing him pain. “The X-rays showed bone on bone,” he said. His doctor referred him to an orthopedic specialist, and Jacobsen assumed the worst: That he’d have to get a knee replacement. But Jacobsen, a 70-year old resident of Port Orchard, Wash., was also given a video and brochure detailing the pros and cons of knee replacement surgery, including interviews with patients who had either opted for it or had chosen more conservative treatment. Referred to as decision aids, the material is designed to give patients a comprehensive and balanced guide to making medical decisions. By the time Jacobsen saw the orthopedic specialist, he knew he wasn’t ready for anything drastic. A longtime volunteer for Habitat for Humanity who is active with his church, “I’ve got to have my legs under me,” he said. For now, he’s “grinning and bearing” the pain, and if needed will use pain medications or more conservative treatments such as cortisone shots from his doctor. Should you get knee replacement surgery? Experts say there’s no objective right or wrong answer — only you can decide. Here are some questions to consider. Jacobsen is not the only patient who came to a similar conclusion. A study published in September in the journal Health Affairs found that introducing decision aids into a large Seattle-based health care system led to 38 percent fewer knee replacements, 26 percent fewer hip replacements, and significantly lower costs for the health system over six months. The study comes at a time when knee replacement surgeries are skyrocketing. The rise has been attributed to many factors: growing rates of obesity, an active population of baby boomers now facing osteoarthritis, and the continuing improvement of artificial joints. The study highlights the role of communication and shared decision-making between doctors and patients in determining who gets knee replacements and other elective procedures. Knee replacement surgery involves cutting away bone and cartilage from the joint and implanting an artificial joint made of metal and plastic. Over the past few decades, the procedure has been increasingly successful, with fewer complications, shorter hospital stays, and more durable joints. But it is still costly, painful, and can occasionally lead to negative outcomes or no improvement. A study by the Agency for Healthcare Research and Quality found that knee replacement surgeries in middle-aged women and men increased 2.5 times from 1997 to 2009, and a study in the September 26 issue of The Journal of the American Medical Association found that total knee replacements in Medicare patients had risen by 162 percent in the past 20 years. One of the primary drivers of the rise in osteoarthritis — a progressive loss of cartilage that can cause pain and inflammation in joints — is obesity, because extra weight stresses joints. But when Elena Losina and Dr. Jeffrey Katz at Brigham and Women’s Hospital Orthopaedic and Arthritis Center for Outcomes Research analyzed the number of knee replacements, weight was a factor in only a quarter of the total increase. “We realized that it’s not just because we as a nation are getting heavier,” Losina said, nor could the rise be attributed simply to more older patients. They propose several other possible contributors: knee osteoarthritis is being diagnosed earlier, consumers are exposed to more advertisements for artificial joints, and surgeons are getting more comfortable recommending the procedure as a way to keep people active as they age. Katz said that the success rate of surgeries has “resulted in something of a shift in how the procedure is perceived.” While doctors who learned the procedure in the 1980s saw it as a drastic measure, “it’s certainly not presented today to trainees as a procedure of last resort,” he said. But some physicians believe a conservative approach to osteoarthritis treatment can help many patients, and often gets overlooked in the rush to replace joints. Dr. John Tierney, an osteopath and orthopedic surgeon based at New England Baptist Hospital and Greater Boston Orthopedic Center, said that that while there are several interim options for patients, knee replacement is a “one-way door.” He sees his role as helping patients forestall that drastic step as long as possible. Some patients get relief from losing weight or opting for bariatric surgery to treat obesity. Others can change their lifestyles to avoid activities that exacerbate the pain and work with a physical therapist to strengthen muscles around the joints. Over-the-counter medications such as ibuprofen can relieve pain and inflammation. Tierney said many patients who have knees that are overloaded on one side can benefit from wearing braces that straighten the knees and take the pressure off the worn side. Some of these patients also undergo surgery to realign existing joints. During pain flare-ups, cortisone shots can provide occasional relief, and injections of lubricating hyaluronic acid — called viscosupplementation — can also help. Dr. John Richmond, chair of the orthopedics department at New England Baptist, said that as osteoarthritis progresses and cartilage at the knee joint disappears, it becomes increasingly difficult to prevent pain. “To date we don’t really have a disease-modifying treatment that slows down the progression of osteoarthritis,” he said, so for many people a joint replacement is inevitable. But because artificial joints can wear out and need to be replaced over time, it’s a good idea for some people to take advantage of other treatments and put off a replacement as long as possible. Ultimately, Richmond said, the choice comes down to a patient’s pain, their tolerance for pain, and the patient’s willingness to accept the risks of surgery. Karen Sepucha, who directs the Health Decision Sciences Center at Massachusetts General Hospital, said that many medical decisions don’t have clear answers. “Whether or not you’re ‘clinically appropriate’ [for a procedure] doesn’t mean you should have it,” she said. When doctors and patients are asked to list their goals and concerns about a procedure, “there’s very little overlap between what the doctors focus on and what the patients focus on,” she said. To ensure that patients who choose major procedures truly want them, Mass. General now gives patients decision aids for 36 different conditions, including knee osteoarthritis. Even when decisions are straightforward, Sepucha said, the aids can help patients have more realistic expectations. For David Wunsch, a 72-year-old retired professor of electrical engineering, the decision was clear. After a bicycle accident followed by knee surgery 12 years ago, Wunsch found that he had developed painful osteoarthritis. Physical therapy and steroid injections failed to help. Although he received a decision aid — a video — from his orthopedic surgeon at Mass. General, “I was in so much pain from this knee, I would have had a replacement whether or not I’d gotten the DVD,” he said. But he credits the video for helping him understand the magnitude of the procedure and the lengthy recovery. After his knee replacement, he can walk much more easily, and is working to improve his artificial knee’s range of motion so he can cycle again. The explosion of knee replacements is forcing physicians to grapple with the questions of what the “right” rate is for the procedure, and whether all knee replacements are warranted. 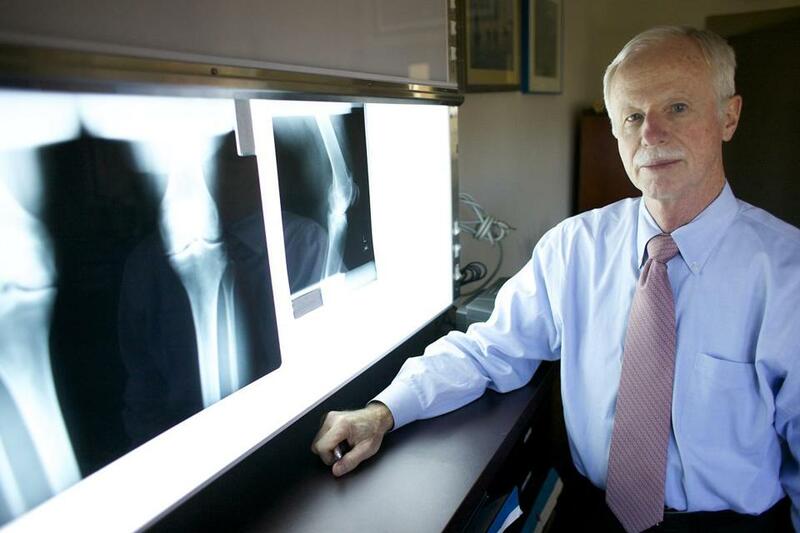 If well-informed patients choose knee replacements less often, as the Seattle study suggests, the answer to the second question seems to be “no.” And Arterburn believes the right rate for any procedure should be the rate resulting from educated patients, in which “the provider and the patient come to a shared agreement,” he said.